Spirits blaze at holiday action for $14 NOW! 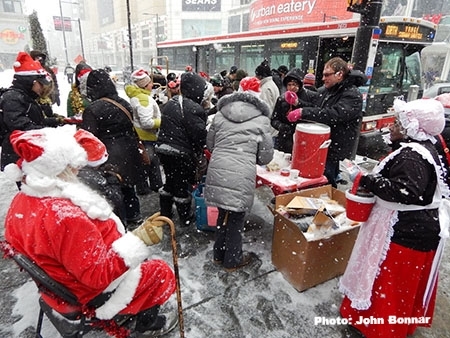 This past Saturday, WAC gathered as part of the Campaign to Raise the Minimum Wage for a holiday minimum wage action outside the Toronto Eaton Centre. 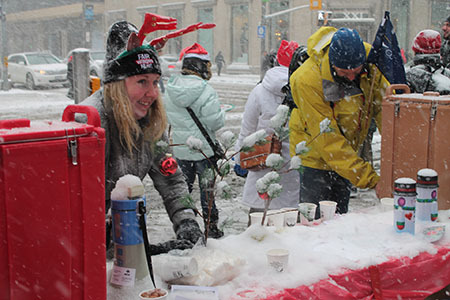 In collaboration with the OPSEU Provincial Young Workers Committee and many supporters, we handed out hundreds of candy canes and cups of hot chocolate – while collecting signatures on holiday cards for Premier Kathleen Wynne. 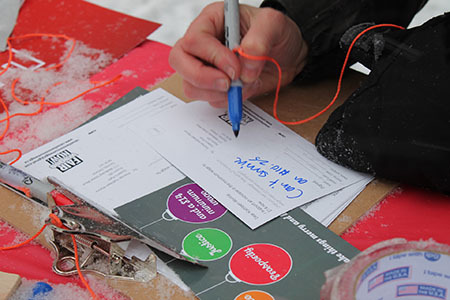 Despite the snow, hundreds of people stopped to sign a card calling for peace, justice and a $14 minimum wage in 2014! 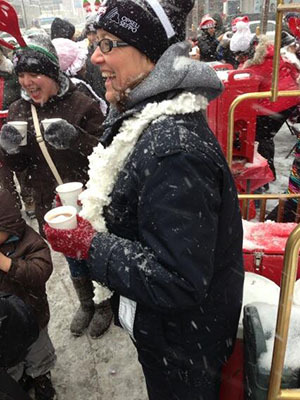 The cold weather didn’t deter us! 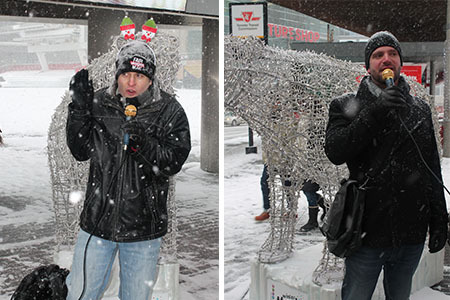 “Body freezing, spirits blazing” was how one supporter described the day! 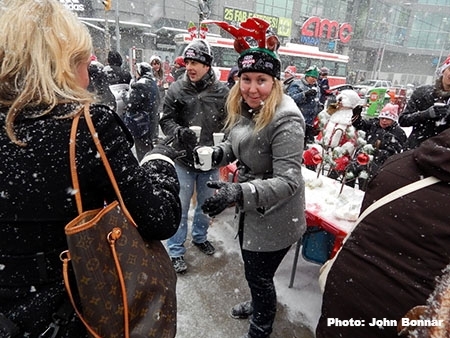 The hot chocolate provided by the OPSEU Provincial Young Workers Committee really drew the holiday shoppers! Check out that snow and wind! 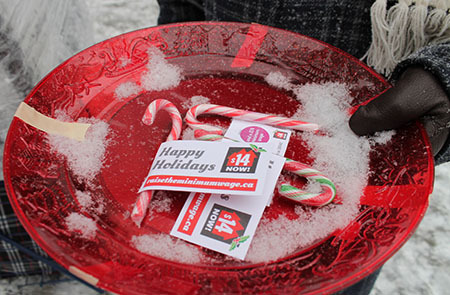 …but people kept coming by to sign holiday cards calling for $14 NOW! WAC member Acsana warmed up the crowd: We are here in this freezing weather because we need a raise! 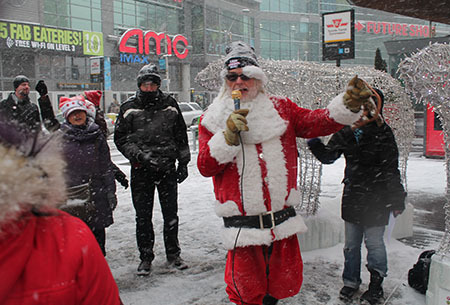 Our Santa Claus, WAC member Paul, spoke about why a minimum wage increase is so important for workers and the Ontario economy. Wesley Killman from OPSEU Provincial Young Workers Committee spoke about why we need to un-freeze the minimum wage. Octavian from the Richtree Workers Community Support Network told us how Richtree is replacing decent union jobs with minimum wage jobs and how we fight back. Thank you to everyone who joined us and helped make the day such a success! Leaders from Fight for 15 – the organization coordinating the inspiring retail worker strikes in Chicago and across the US – will be keynote speakers at the forum, along with performances from Ritalin and more. You don’t want to miss this one! Sign up at https://www.facebook.com/events/608238165909898/ to get updates and more details. 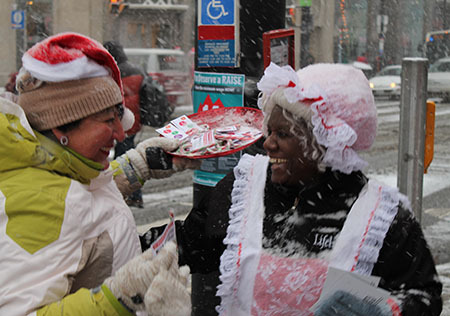 From all of us at WAC, happy holidays and Happy New Year! This year has brought some important wins for Ontario workers, and working together, we know that 2014 will bring even more! Thank you for joining us in the fight for fair wages and working conditions for workers in Ontario!